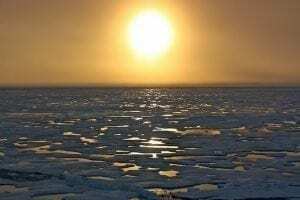 According to the National Snow and Ice Data Center (NSIDC), as of September 16 Arctic sea ice reached its seasonal minimum for the year at 1.32 million square miles (3.41 million square kilometers), the minimum seasonal extent in the satellite record that began in 1979. NSIDC cautioned that changing wind patterns over the next few weeks could push the minimum even lower, but in any case the September 16 measurement reinforces the longterm downward trend in Arctic sea ice extent. The 2012 minimum (so far) occurred three days later than the 1979-200o average sea ice minimum date of September 13. This year’s minimum extent was 293,000 square miles (760,000 square kilometers) below the previous record low minimum extent in the satellite record set on September 18, 2007 – an area roughly the size of the great state of Texas. The 2012 minimum is 1.27 million square miles (3.29 million square kilometers) below the 1979-2000 average minimum, and since we’re using states as comparison, that’s equal to about twice the size of Alaska. The ice minimum for 2012 is thus 18 percent below the previous 2007 record minimum and 49 percent below the 1970-2000 average. 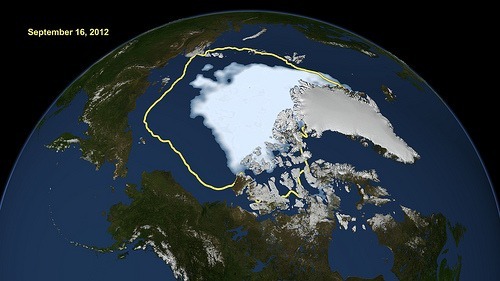 In terms of total ice loss from seasonal maximum to seasonal minimum, Arctic sea ice loss was 4.57 million square miles (11.83 million square kilometers) from the March 20, 2012 maximum to the September 16 minimum, representing the largest summer sea ice loss in the satellite record. The six lowest seasonal Arctic ice minimums in the satellite record have all happened in the past six years.